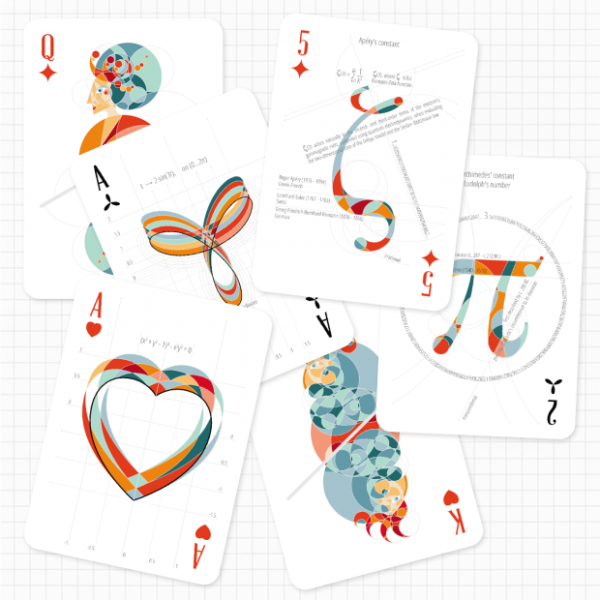 Math Stack is a deck of playing cards with mathematical artwork on the faces. The makers call it “a potent and effective learning tool”. I’m not convinced about that, but they are so pretty! A couple of months ago (really? Two years?! Man!) I posted about an extraordinary coincidence: in a game of whist at a village hall in Kineton, Warwickshire, each of four players had been dealt an entire suit each. My post ‘Four perfect hands: An event never seen before (right? )‘ discussed this story. What really interested me was that the quoted mathematical analysis — and figure of 2,235,197,406,895,366,368,301,559,999 to 1 — appears to be correct; what lets down the piece is poor modelling. The probability calculated relies on the assumption that the deck is completely randomly ordered. Apart from the fact that new decks of cards come sorted into suits, whist is a game of collecting like cards together, so a coincidental ordering must be made more likely. Still unlikely enough to be worthy of mention in a local paper, maybe, but not “this is the first time this hand has ever been dealt in the history of the game”-unlikely. Anyway, last week I was asked where the quoted figure 2,235,197,406,895,366,368,301,559,999 to 1 actually comes from. Here’s my shot at it. A while ago Christian Perfect suggested the monthly local Maths Jam organisers might write up what happens at Maths Jams to their blogs so others can get a feel for what goes on. I regard this as a good idea I haven’t got around to yet. Luckily, Christian has just made a video showing a card trick we have played with at the Nottingham Maths Jam, so that makes this an easy post! I was shown this trick by Matt Parker in a hotel bar in Coventry, who refused to say how it works. I went to the Nottingham Maths Jam in November 2011 having worked out how to do the trick but having spent no time at all considering how it might work, saving this for Maths Jam. I showed John Read, Kathryn Taylor and Sharon Evans and together we worked out the details given in Christian’s video. To praise [Bolyai’s work] would amount to praising myself. For the entire content of the work … coincides almost exactly with my own meditations which have occupied my mind for the past thirty or thirty-five years. I regard this young geometer Bolyai as a genius of the first order. I have just met with Green’s memoir, which renders a separate treatise on electricity less necessary… I have, most unwittingly, trodden almost exactly in his steps as far as regards electricity. I’d say playing around with tricks and working out how they work is a very Maths Jam activity so anyone considering attending one should regard this as very much the sort of thing that happens at a Maths Jam. Find your local one, or set one up!